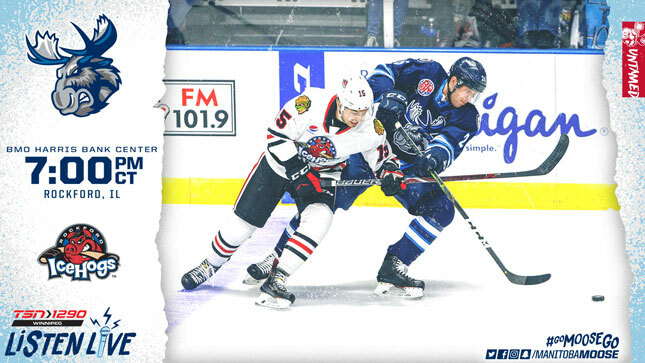 The Manitoba Moose (19-18-3-1) continue their road trip tonight, at BMO Harris Bank Center in Rockford where they’ll take on the IceHogs (17-19-3-5). Tune in for the pre-game show at 6:45 p.m. on TSN 1290, moosehockey.com/listenlive/, the Moose App, and streaming live on AHLTV. Manitoba has had success in Rockford in the past, holding an 8-1-0-0 regular season record at BMO Harris Bank Center since returning to Winnipeg. In the only meeting earlier this season between the clubs, the Moose rode Mikhail Berdin’s 35-save performance and won in a shootout on Seth Griffith’s game winner. Griffith comes into today’s action riding a seven-game point streak with 10 points across that stretch (1G, 9A). In Wednesday’s OT loss to the Griffins, Griffith threaded a pass through to Logan Shaw who scored the lone Manitoba goal. Shaw leads the team in both goals (17) and points (28) in 35 games this season and has scored in five of his last eight games. The goal on Wednesday was Shaw’s eighth of the season on the man advantage, which is twice as many as the next Moose player (C.J. Suess). The penalty kill also had success against Grand Rapids, shutting down all seven of the Griffin’s power play chances. In their last five games, the Moose PK is sitting at 86.7 per cent. Captain Peter Stoykewych said the success of the penalty kill comes from preparation. Manitoba has yet to find their road legs in 2018-19. The team has a 0.614 winning percentage at Bell MTS Place this season, but only a 0.395 rate when travelling. Those numbers are quite the opposite of 2017-18, when the Moose had a 0.711 points percentage in road contests, but 0.500 at home. Tonight’s game will be the fifth for Stoykewych’s team since the “reset” at the holiday break, and he knows figuring out home to improve their away record will be the key to making a playoff push. The Moose wrap up the schedule leading up to the all-star break tomorrow afternoon (1 p.m. CT) in Milwaukee. That game will be available on TSN 1290, moosehockey.com/listenlive/, the Moose App, and streaming live on AHLTV. You can follow the Moose while they’re on the road on social media or moosehockey.com.